Applications are now being taken for the 2018-19 Golf Program. 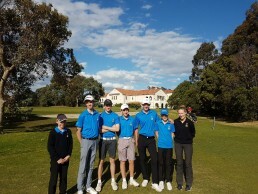 This Program is conducted in partnership with Golf Victoria and will allow junior golfers to access the state coach and state training facility as will as our local Victorian Golf endorsed academy coach – Dean Dixon. We are seeking young golfers aged 12 – 18 years who have demonstrated their potential in local tournaments / events. Opportunities also exist for young golfers who demonstrate potential. For further information please see the attached brochure. If interested please click on the link below to register.